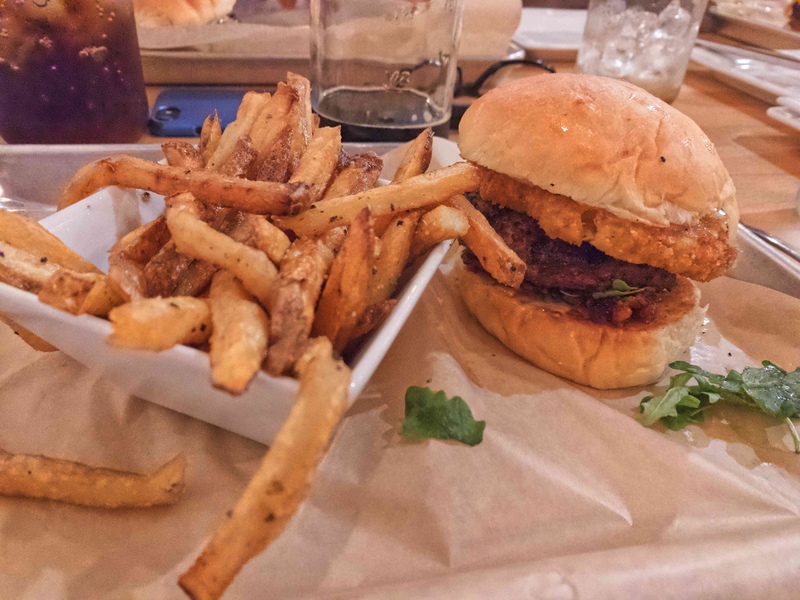 “You shouldn’t have cooked my burger, which I ordered medium, to the consistency and taste of a charcoal briquette. The only flavor the burger had was from was the char and the sour taste of the sad clump of bleu cheese lumped under the patty. The candied bacon seemed to be trying to escape this mess as it was clumped on one side. “Really, you shouldn’t have.” 2 out of 5. Every bite was worse than the last and yet still, I kept going, thinking that I’d get to that one good bite. The jam and the mayo were not spread evenly and there needed to be more onion straws. I think there was a dime-sized glob of the creamed feta somewhere in there. “But nobody could overwhelm spicy Korean mayo with char!” you say. “Hold my beer”, says Scratch. “Utter tripe. I was hungry, and I didn’t finish it.” 2 out of 5. “No character to the beef and forgettable flavor.” 2.25 out of 5. Chad made it pretty clear, this probably wouldn’t be a December to remember, “The presentation was dismal.” The burgers and small cup of fries sat forlornly on a small metal tray, the bottom covered haphazardly with a sheet of parchment paper. It looked like a bad school lunch. The yolk on the fried egg had popped before the burger was delivered. “Rather than a flow of golden lava at the first bite, I got a bottom bun that had been spot-welded to the parchment paper underneath by drying yolk.” It got worse. 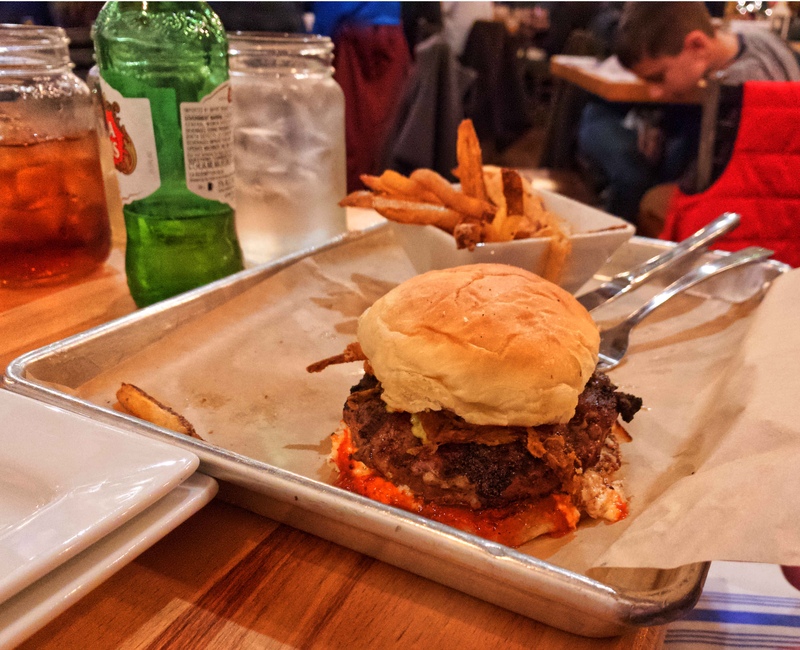 “The sloppy, unstable build caused the patty and all toppings to squirt out the back of the bun when I attempted to pry the burger from the paper.” After that and a stack of napkins, Chad attacked his burger with knife and fork. Scratch did prove that they could cook a burger correctly, though. Chad’s was cooked to medium and lacked the char that ruined everyone else’s. The pickled ginger was excellent. Frankly, though, it would be pretty hard to mess up pickled ginger. “I have only had one burger this bland before, a Sheetz gas station burger that I ordered out of morbid curiosity. 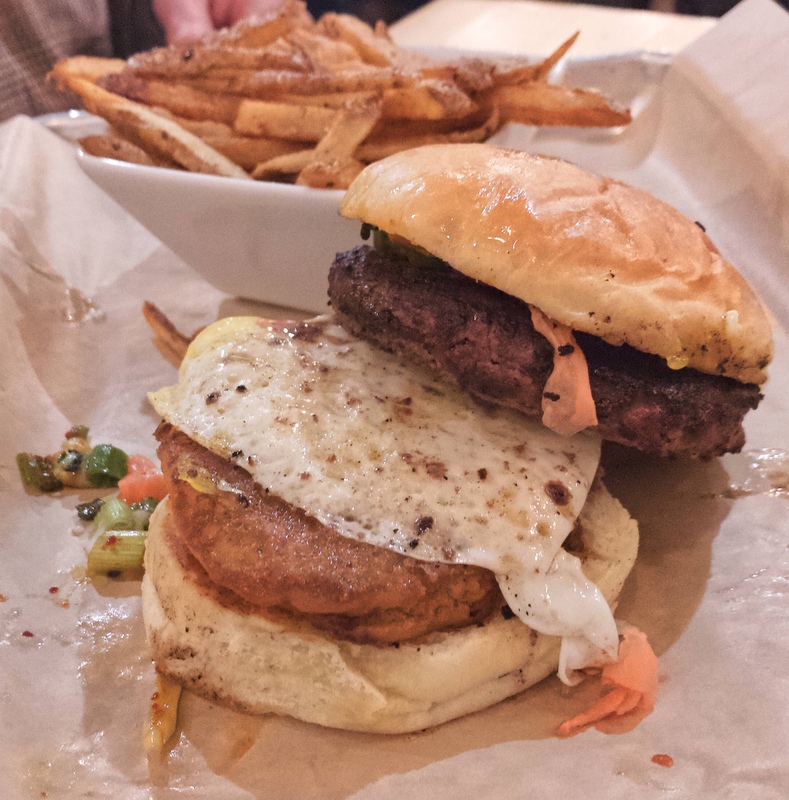 The Scratch Ramen burger tasted like not much of anything, an undifferentiated protein with meat-like qualities. I was sad and disappointed rather than angry, so it merits a 2. But it is the holidays…” 2.25 out of 5.